It would have been so easy for K to be for knitting. I considered having K be for Ken, my brother, but then L would need to be for Linda, and I have something else in mind for L. I was considering if K could be for Ken&Linda, when I thought, "Not Ken, but kin!" The Robert Frost quote is about home, and to me that means family. I've been thinking of family a lot lately. It's one reason I decided to move back to the Midwest. Since I've moved back, I've seen a lot more of my family -- my aunts, uncles, cousins. My dad's side of the family is large. He was one of 9 surviving children, and they had 29 children. Twenty-seven of us are still around, and I've seen all but two in the last year or so. I once laughed that we range from poor white trash to PhD's, and that's when my sister pointed out that any one of them would take any of the others in, if needed. And she's right -- we're a diverse bunch, but we're definitely family. Most of us are outgoing and have a sort of goofy sense of humor. And even those who don't have that sense of humor appreciates it in the rest of us! We like each other and even if years have past since we last saw each other, it's like those days when we were kids and saw each other frequently. This picture was taken in the spring of 1957 -- probably Easter (which was late, April 21, that year) or Mother's Day -- notice that Grandma is wearing a corsage. I'm the baby being held in the middle of the top row. See the arc of four little girls all dressed alike on the right side of the photo? Not surprisingly, they are sisters and, together, four of the funniest women I've ever met. Not only do they get the funny gene from their dad's side of the family, but their mother is probably the absolute funniest woman I know. She was recently hospitalized with a little heart problem, and was shocked to discover after her release that she was supposed to refrain from laughing -- absolutely not a possibility, even while she was in the hospital! And here's my dad and his siblings with Grandma, the same day. Dad's the one in the upper right. 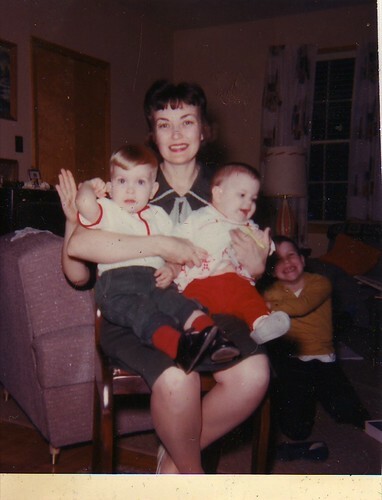 The aunt hiding behind her sisters in the upper left must have been very pregnant, especially if this picture was taken on Mother's Day -- her younger son, my cousin Bill, was born on May 20, 1957! This picture was taken at my other grandma's house. 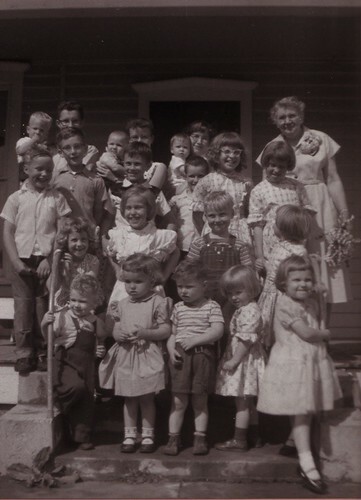 You saw most of those cousins here -- missing were Ken, Linda, Gary, and Carol, born the same year as Gary and the year after Teresa, the baby in that picture. My mom's side of the family is much smaller, much quieter, and in many ways, much more complicated than Dad's side. But still, I think, any one of us would take in any of the others. That's what family is for. I envy you your large and closeknit family! Aw! That made me cry. I literally thank God every single night for my family, all of 'em. I know how blessed we are to have each other. 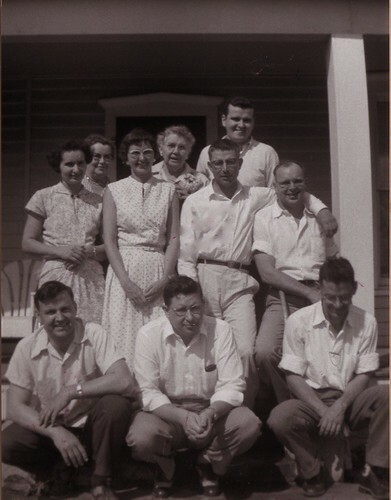 One of the best things that has ever happened to me was at Dad's funeral luncheon - most of the cousins were there, and many, many, many of them took me aside and said, "Don't tell the other aunts and uncles, but your folks were my favorites!" What a wonderful tribute to Dad and Mom. These are great photos, thanks for sharing them with us. You have a beautiful family. Dude, you look a lot like your mom!!! My 'rents both come from large families like that too. You're lucky to have met yours! That was so sweet and like Linda it made me cry. I would like an copy of those pictures sometimes. But then again I find them when I go through Grandma's pictures. Was Wayne the baby on the end or do you know? That kinda looks like Grandpa holding him.